Comfort Goes a Long Ways! I must say these are very comfortable DJ headphones. You will have no problem wearing these for hours on end. A little too loose. Not a problem for people with larger heads. If you plan on moving around a lot you may want to consider other models. The sound quality on the ARCTIC Sound P281 is very good considering it's low cost price. 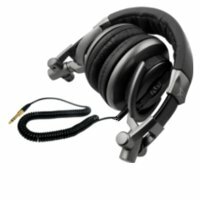 I have been using other similar Arctic headphones and would say these are on par with them. The biggest plus is how comfortable these headphones are. After a few minutes I forget I'm wearing them. With the ARCTIC Sound P281 you are definitely getting your monies worth. For the MSRP of under $30 dollars it's hard to find a better headphone set that is in the DJ niche. The sound quality is quite decent. Sounds come in crisp and outside noise levels won't disturb your listening experience. The 90-degree swivel for both earcups allows DJs to have single-sided monitoring. You will also get a 6.3mm adapter so these DJ headphones with fit your gear. The default size on the Arctic Sound P281 is the standard 3.5mm. What really sets this item apart from other DJ headphones is the comfort level and ultra low cost. It's hard to find a set of headphones that you can wear for hours on end. The comfort level on these is just great. It has a has an adjustable padded headband made from artificial leather and the earcups have a very soft cushion. Besides the 90-degree swivel, what makes these DJ worthy is the noise Isolation that these headphones have. In a loud setting you will be able to tune out ambient noise so you can focus on what you do best.